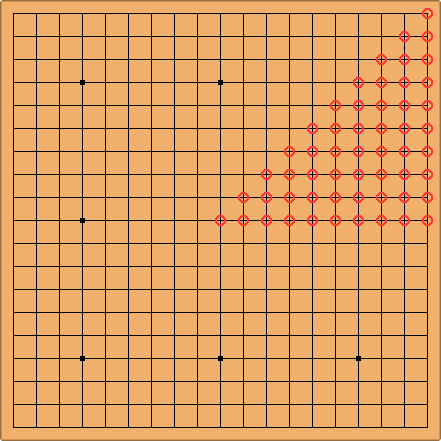 It is the custom for Black to play in their upper right corner first, on one of the marked points in the diagram (as seen by Black). The rationale behind this gesture seems to be that White doesn't need to stretch to the opposite side of the goban in order to either occupy an empty corner or directly answer to the first black move. 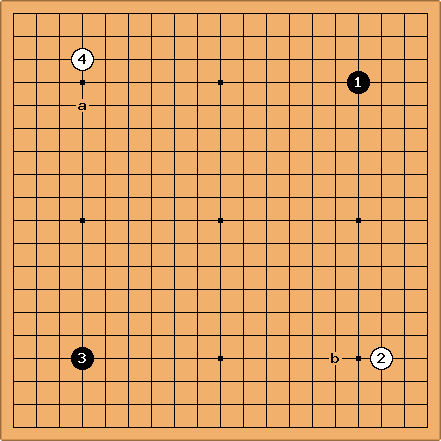 (White has to stretch if White wants to force Black into a parallel fuseki, but that's another matter.) In professional games it is very unusual for a game not to start in the top right corner. However it does happen. For example in a big title match in Japan, Yoda Norimoto once opened in the top left against Cho Chikun to demonstrate his determination to take the title from the title holder. A root of this can be found in traditional Japanese etiquette: In the times of old, the Master would hold the white stones, and sit at the Goban in the place of honour, with his back to the tokonoma, the ornamental alcove very often graced with a calligraphy scroll and a flower arrangement. The disciple, starting the game playing Black, would bow to the Master, and in doing so would place the first stone with the right hand in his farthest corner, i.e. the upper right one. Playing there is therefore a ritual bow to your Master, or, in our more trivial times, to the stronger player. For the same reasons, etiquette prescribes the order of placement of handicap stones, again allowing White to play their first move against 1 to 3 handicap stones with minimal effort. One might ask if you can extend this principle to other symmetric positions. For example, in the following position, would it be politer for Black to approach at a rather than b assuming that a is closer to the white player? The usual answer is that after the first move, there are no further conventions which would restrict where you should play. Robert Pauli: certainly should be at . Japanese (among others, of course) traditionally write vertical columns; top to bottom, right to left. For the same reason, Black should prefer b. It's the writing direction, not the bowing, in my opinion.